Recently, the City of Osseo engineering consultant, Bolton & Menk, has delivered a powerful and new Geographic Information System (GIS) to City staff. GIS is a computer based modeling system which lets its users visualize, question, analyze, interpret, and understand data to reveal relationships, patterns and trends. GIS benefits organizations of all sizes and in almost every industry. There is a growing awareness of the economic and strategic value of GIS. GIS allows users to increase efficiency which then improves cost savings, make better decisions, improve communication between departments and the public, improve record keeping, and manage geographic information. In a short answer, GIS is a sophisticated mapping tool that planners and public works employees use to gain up-to-date information on parcels throughout the community. All mapping is maintained in the ESRI ArcGIS mapping environment. This application utilizes ArcServer technology to deliver GIS quality maps. The Osseo Web GIS viewer allows City staff to have access to the ArcGIS based mapping from an Internet Browser that supports Microsoft Silverlight. The application also leverages several powerful GIS tools for analysis and map creation. Bolton & Menk has spent a significant amount of time taking inventory of parcels here in Osseo. By inserting all of the data in the GIS system, users can turn on/off different map layers to show such things as sewer/water/drainage connections, elevation changes, street and alley information, and parcel data. Staff can also create visual maps for reports and memos more easily. Road Construction Worries: You Can Still Get To Osseo! Minnesota is well-known for two seasons – the never-ending winter season and, of course, road construction season. This year, ground zero for both seasons is right here in Osseo. The Minnesota Department of Transportation (MnDOT) has begun construction at the intersection of Highway 169 and County Road 30 (93rd Avenue) to include some much needed improvements. Construction even started before the snow has had a chance to melt. Bright orange road construction signs are a real barrier to those who use the familiar north entrance into Osseo. While the interchange is in dire need of a face lift, doing so cuts off an important access point for the City of Osseo. Rest assured, Osseo is still accessible – it just takes a little more planning. Many years ago, Jefferson Highway was the main thoroughfare in and out of Osseo. This familiar road still passes right through downtown Osseo – we just call it Central Avenue. From the north (and south), Old Jefferson Highway provides a true path into the heart of Osseo. From Anoka and points north, exit Highway 169 earlier at 109th Avenue in Champlin and head west. Just a few hundred feet away, turn left (south) onto Old Jefferson Highway. About 5 minutes later (after flying over Interstate 610) you will be cheering as you arrive at the edge of Osseo. Fear not, however, if you happen to be riding with one of those distracted drivers and miss the 109th Street turn. Continue on down Highway 169 to the off-ramp at 85th Avenue. Stay left on the off-ramp and look for signs to County Road 81 North. Two right turns later and you are in Osseo on the southeast side. Road construction can be a barrier for residents and visitors of Osseo. Many times the city gets cut off during much needed infrastructure improvements. But we’re here to help guide you right to our downtown businesses, regardless of construction detours. You can always get more information from our website, which outlines the project, provides updates and schedules, and contact information should you have any questions or concerns. So set Osseo, Minnesota as a destination in your GPS and come by to visit! You’re always welcome in Osseo. Posted in City of Osseo News, Osseo Projects	| Tagged Business Friendly City in Minnesota, Central Ave, City News, City of Osseo, City of Osseo Website, construction, Highway 169, Jefferson Highway, MnDOT, Osseo, Osseo Business, Osseo MN, Road construction	| Comments Off on Road Construction Worries: You Can Still Get To Osseo! A Blog About…City of Osseo Blogs! Welcome to the City of Osseo Blog! We recently updated our website, which included a host of new features coupled with a better overall user experience. With that, came the opportunity to better communicate with Osseo residents, business owners, and visitors to our city. We’ve recently undertaken a sweeping new social media campaign designed to engage residents and businesses owners on City events, City news, and various other updates. After all, an informed public and a happy public! From time to time, City of Osseo staff will post blogs on a number of issues. These can range from brief project updates to more in depth City issues. All are designed to get people talking about what is happening in the City of Osseo. 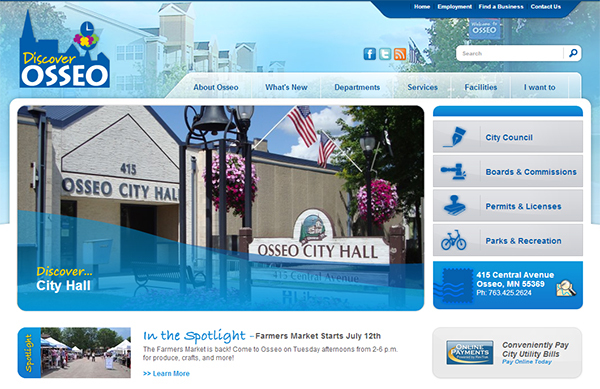 The City of Osseo has partnered with Prime Advertising, a local company specializing in communication and marketing, to produce an informative blog site which City staff keep up to date. If you find yourself with more questions after reading a blog post, do not hesitate to contact City staff to talk. We’re ALWAYS open for discussions. Additionally, if you are on Facebook and/or Twitter, we invite you to Like us and follow us. Facebook and Twitter are just two more easy (and cheap!) ways that municipalities can connect and communicate with it’s citizens. Please be sure to Like us on Facebook (facebook.com/pages/discover-osseo) and follow us on Twitter (@CityofOsseo). Posted in City of Osseo Events, City of Osseo News, Osseo Businesses	| Tagged blog, blogs, City News, City of Osseo blog, City of Osseo Website, City Updates, Osseo Minnesota, Osseo MN, Osseo Website, Prime Advertising	| Comments Off on A Blog About…City of Osseo Blogs! As the City of Osseo continues to grow and evolve, the time has come for a re-vamped Osseo website. Starting April 1, the newly updated Discover Osseo website will go live, incorporating a host of new tools, more information, and a refreshing new look. The City of Osseo has partnered with Prime Advertising, a local company who specializes in media relations, to develop an updated website which will provide users with a more enhanced experience. Changes include more information, better website navigation, and an overall upgraded feel to the website. Have a question about City services? You can easily find the answer on our new website. Need contact information? You can easily find that as well. Need to pay a utility bill or find out about upcoming City events? Yep, you can get all of that, and much more, on our new website. City Staff is proud of the new website and urges all residents and visitors to check out our new website! Please visit www.discoverosseo.com to check it out.